Nutrient management is important for getting better and more consistent yields. There were a lot of guesses why one plot of organic hemp looked so poor compared to another a few metres away. Competition from weeds? Soil compaction? Variety? Finally someone correctly guessed seeding date. But there was a surprise. The thriving plot was planted later than the poor one — much later — which is counterintuitive. On average, earlier-seeded crops do better than later ones. Organic farmer Wayne Williment seeded a field of organic hemp June 12 and the poor plot was part of it; the healthy plots were planted June 28, Hemp Production Services’ agronomist Alden Braul told two dozen people at a field day here Aug. 23. Williment’s hemp emerged fine but soon after was hit by a heavy rain, he said. “It just sat there,” he said. Because of wet conditions, Braul wasn’t able to seed his plots in Williment’s field until June 28. Williment worked up most of the field Aug. 1, leaving a small plot for comparison. But he told field day participants based on how well the later-seeded plots were doing, he wishes he’d terminated the field July 1 and reseeded it. There were two factors at play. One was the heavy rain, which hurt the earlier crop. The other was improved weed control in the later-seeded crop. 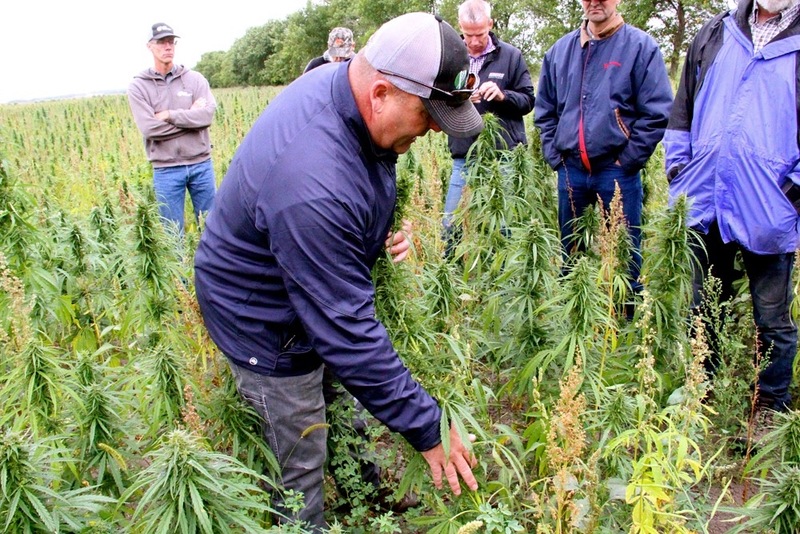 “Given the chance, hemp is a very good competitor… but you have to do all you can do to make it competitive,” Jeff Kostuik, director of operations for Hemp Genetics International told attendees. “I think essentially that’s the take-home. In one trial Kostuik seeded hemp the second week of July. He didn’t harvest until November, but there was at least something to harvest. “We didn’t have to summerfallow all year,” Kostuik said. Hemp Production Services’ price for organic and conventional and hemp seed is around $1.80 and 78 cents a pound, respectively, Braul said. Conventional dryland farmers harvest 800 to 1,000 pounds of hemp seed an acre, Braul said. Organic yields range from 400 to 800 pounds an acre with some as high as 1,000. Braul’s trials at the Williment farm include comparisons of different organic fertilizers and different fertilizer placements. Cultivation, just ahead of later planting, might make more nitrogen available, for example. And that’s a nutrient farmers can produce with legume crops, and add with composted manure or organic fertilizers. Moreover, Entz said there’s no shortage of phosphorus in organic fields at the university’s Glenlea research station after 26 years of growing crops. “The only place where we have really run out of phosphorus is where we have hay crops in the rotation that take that phosphorus away from the field and when we don’t return it in manure,” he added. The cheapest source of nutrients for organic crops is composted manure, Entz said. It costs about 90 cents a pound compared to various organic fertilizers at $3 a pound. Entz said he’s also researching struvite — nutrients extracted from human waste. “That’s exciting,” he said. “It’s not registered for organic right now, but there is a lot of interest in getting struvite in 2020, when the organic regulations are revisited. Apparently they are going to push hard for struvite. We are doing research on struvite in organic systems. It’s called Crystal Green. It’s already being used in Manitoba on conventional farms. Entz added farmers need to use inoculant when seeding legume crops to ensure they fix nitrogen. He has seen several fields of sweet clover that didn’t nodulate.